I did it. I pulled the trigger. 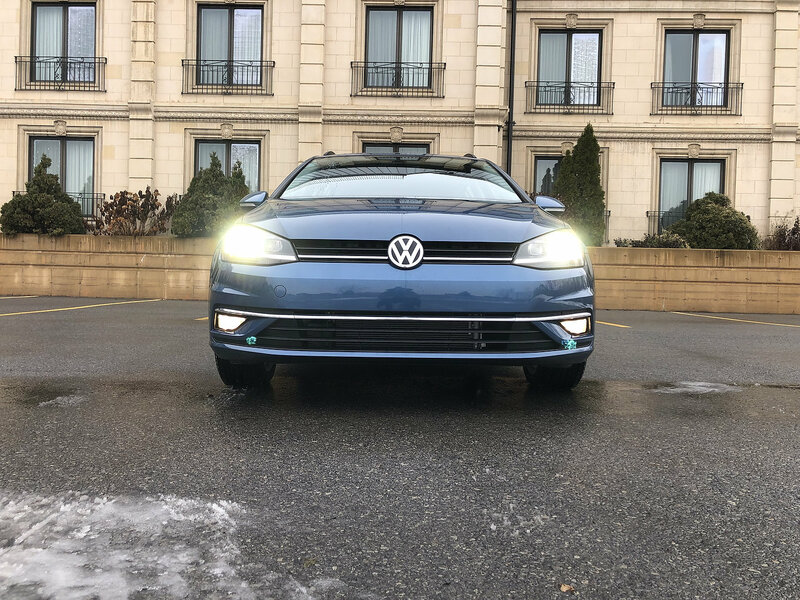 I bought a new car and despite still wondering why I did it, I couldn’t be happier. 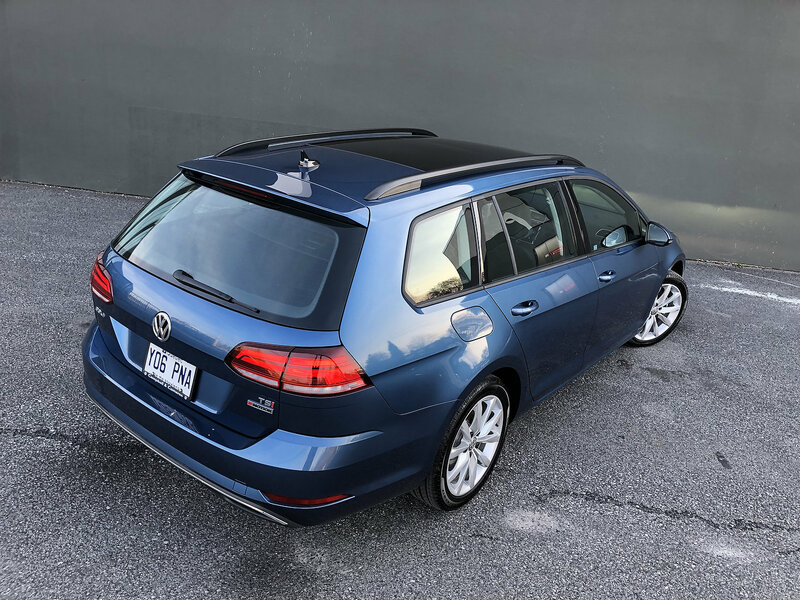 Happy mostly because the 2019 VW Golf Sportwagen as I spec’d it out is the last of its kind. And although that may be the case, it’s quite popular. 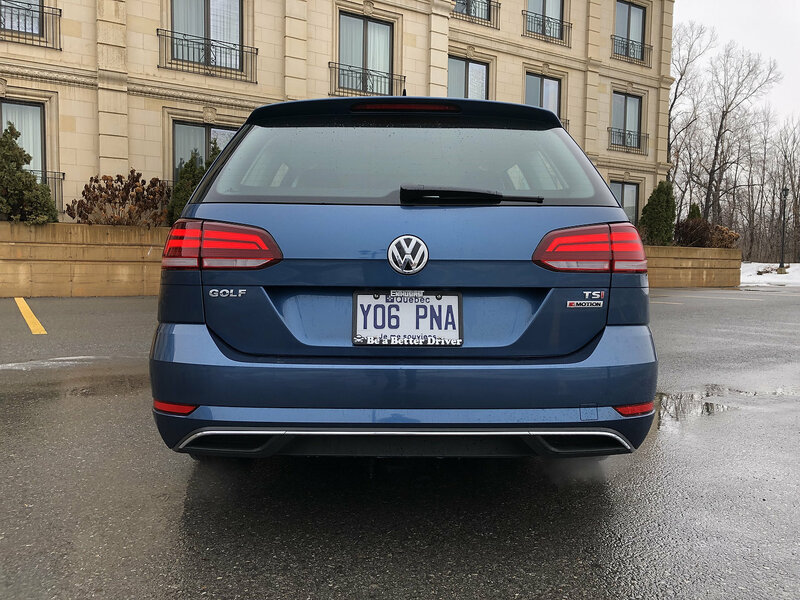 Volkswagen Canada has revised trims for 2019. 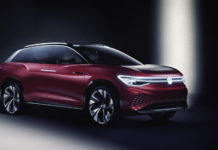 The base model is the Comfortline, which replaces the Trendline. 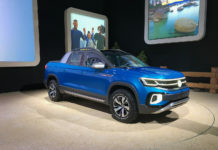 The Highline is the 2018 Comfortline equivalent while the top trim is now the Execline. 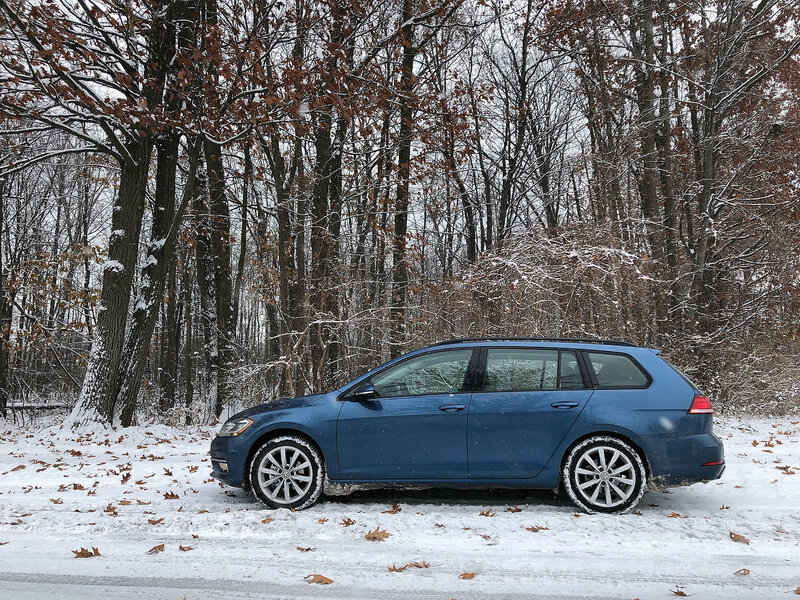 Full disclosure: My Golf Sportwagen Comfortline is a 2018 (couldn’t pass up on 0% financing). 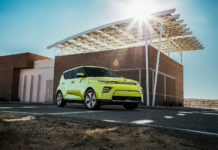 The only difference between it and a 2019 is that Climatronic dual-zone HVAC is now included. Everything else is identical. 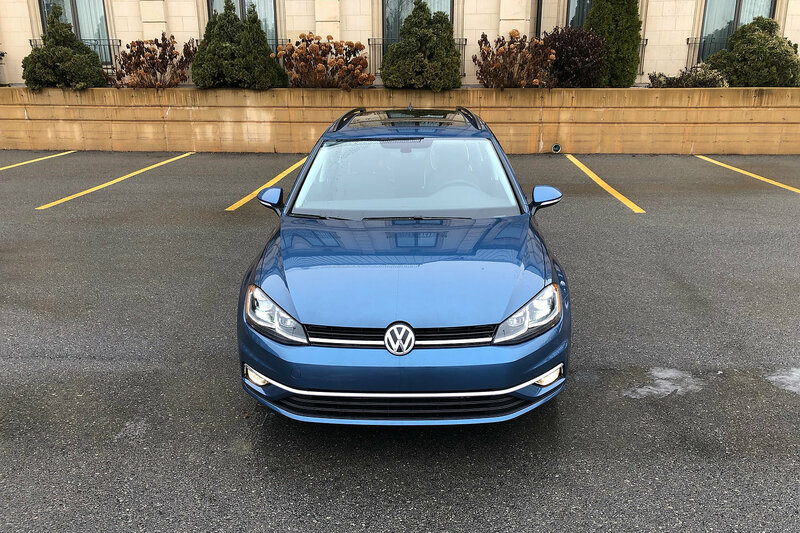 My car is car is equipped with VW’s 4MOTION AWD system and the clincher, the 6-speed manual transmission. While I was shopping, I did glance over at the Outback but because Subaru decided to pull the manual transmission from its lineup, it got struck off the list. My small family and I are average, with average needs. 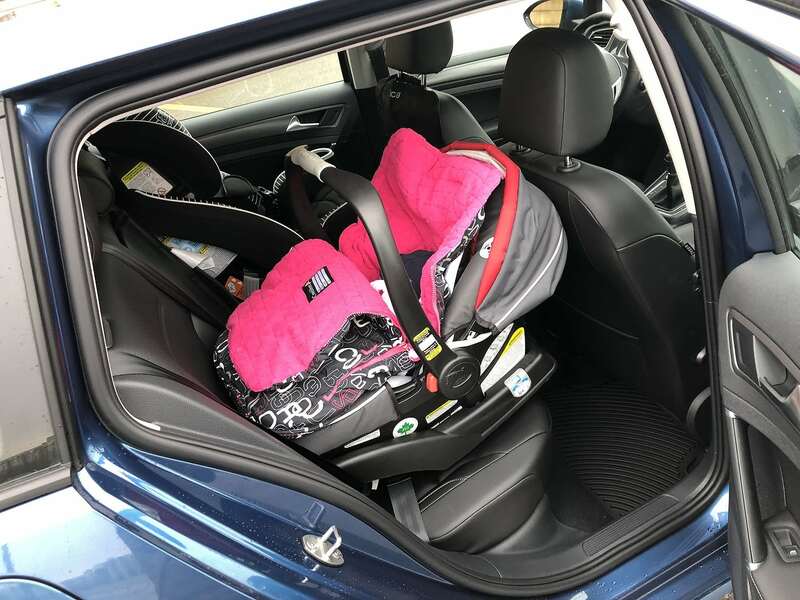 Otherwise put, this means that we require a vehicle that can easily accommodate two baby seats, a stroller and still manage to swallow the contents of our weekly trips to Costco. 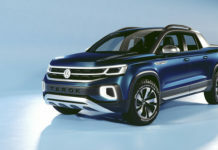 While a Volvo XC90 or Chevrolet Tahoe would make life somewhat easier, we can’t afford them and ultimately they are far too large – we wanted something right-sized. 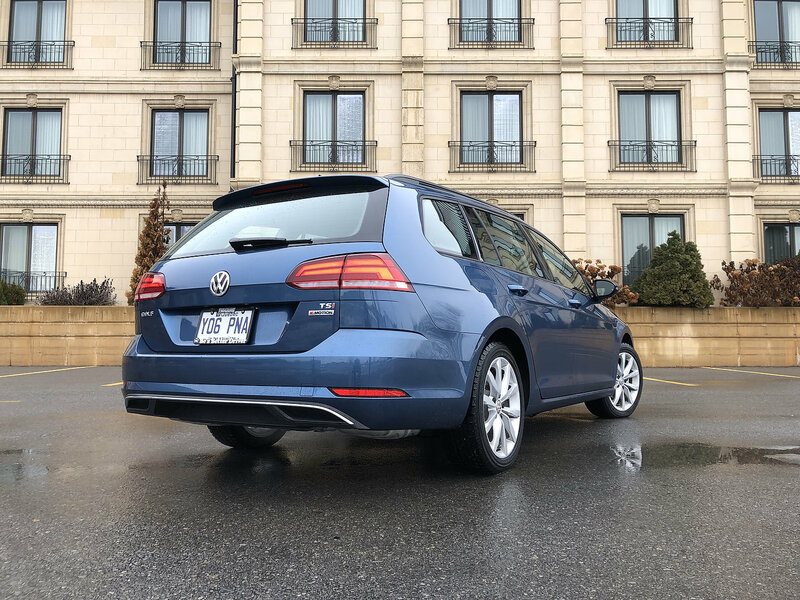 You’ll notice that I don’t bring up vehicles like the Acura RDX or even the Mitsubishi Outlander PHEV because the Sportwagen’s boot is larger than the Acura’s, equal to the Outlander’s but the Golf’s far better on fuel! 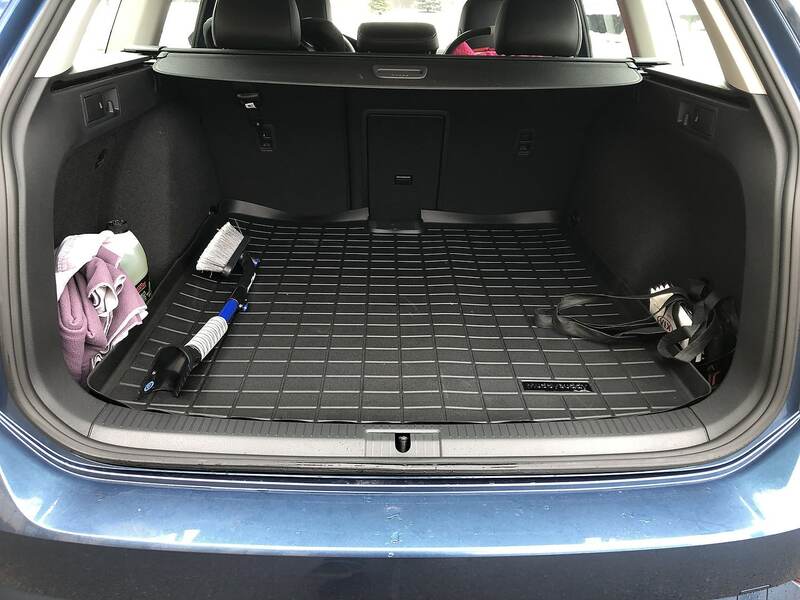 With 860 litres always available, the VW Golf Sportwagen’s trunk is huge. Its wide opening and depth allow it to swallow loads of gear. 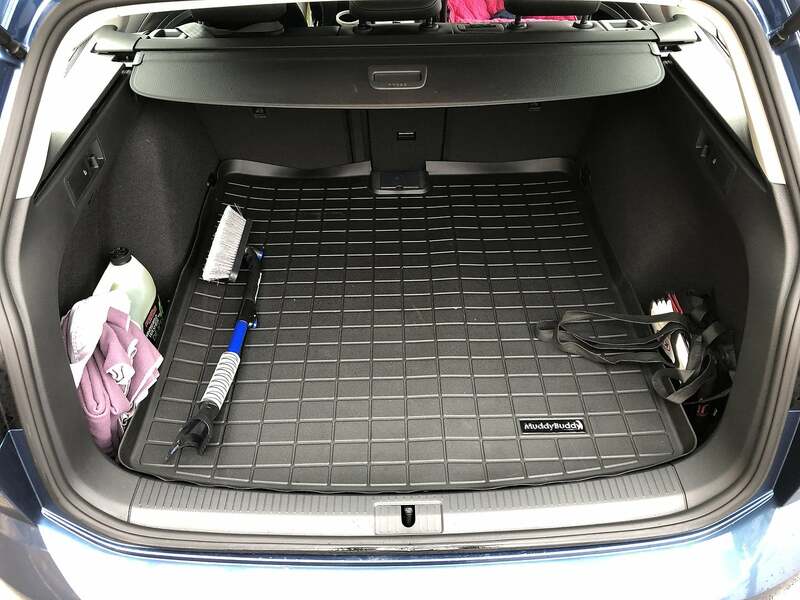 With the 2nd row stowed, volume grows to just shy of 1,900 litres – there’s no real need for something bigger. The back seat itself is perfectly suited to our two baby seats. 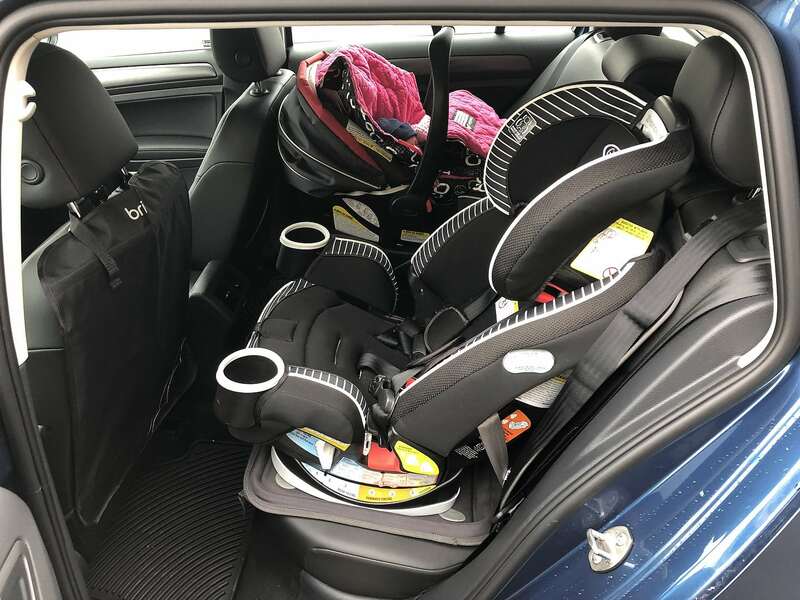 There’s no room for a third occupant on the back seat however the space is ideal for the diaper-bag and a blanky or two. 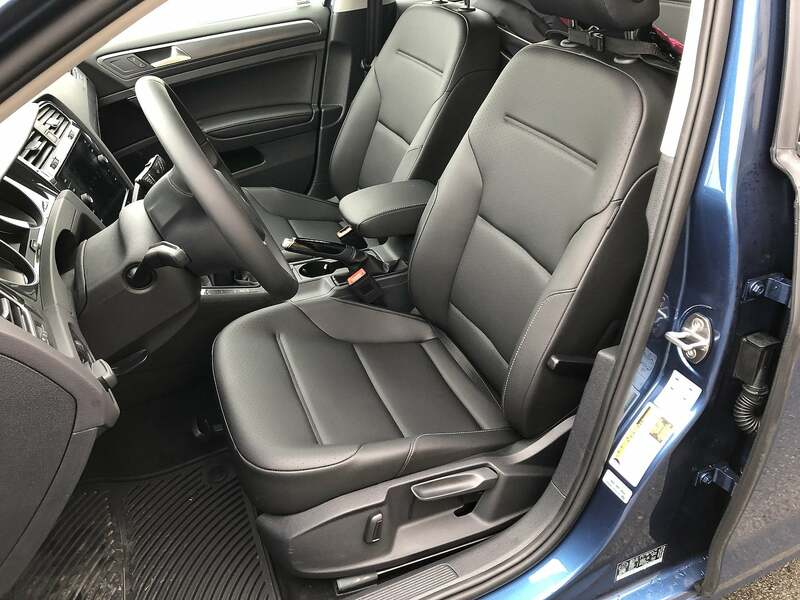 As my son continues to grow at an alarming rate, a seatback protector is necessary but then, it would also be the case in a Mazda CX-5 or nearly all other compact crossovers. 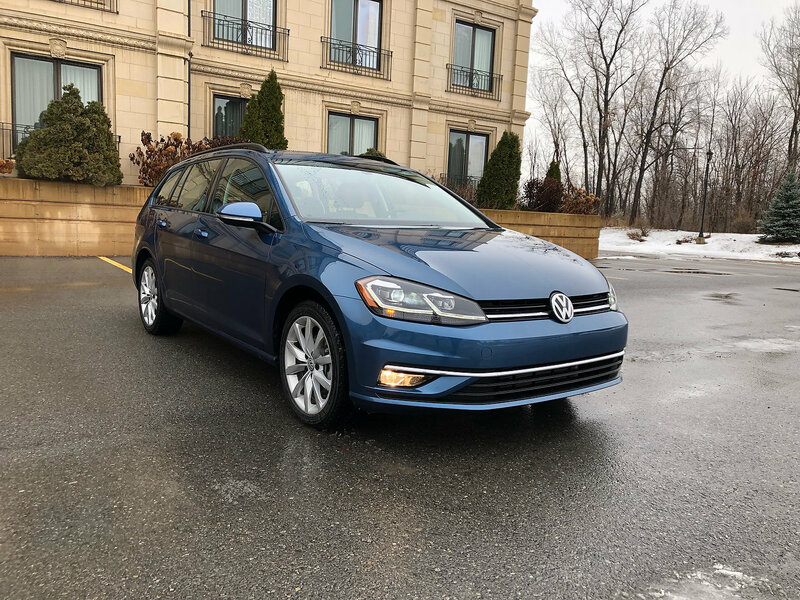 And now, for the adults, the $24,400 2019 Golf Sportwagen Comfortline throws in comfortable and supportive heated front seats, App-Connect smartphone integration (Android Auto, Apple CarPlay, MirrorLink), 6.5-inch touchscreen and more. 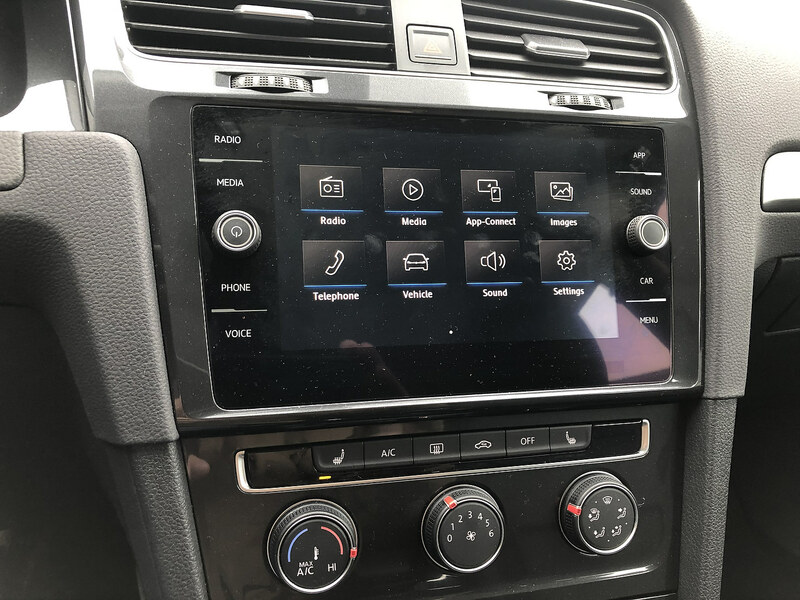 The mid-trim $27,500 Highline, the equivalent to my model, gets an 8-inch touchscreen, leatherette, keyless access and SiriusXM satellite radio. 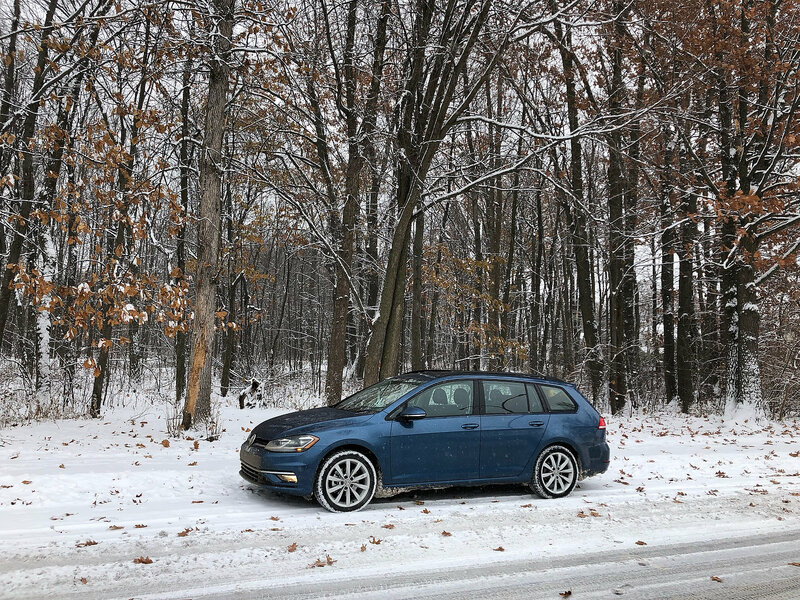 As tested with AWD, the car sports a $29,900 sticker price. The dashboard’s ergonomics are spot on with all important controls well within reach. The HVAC controls are independent from the touchscreen and can always be accessed. 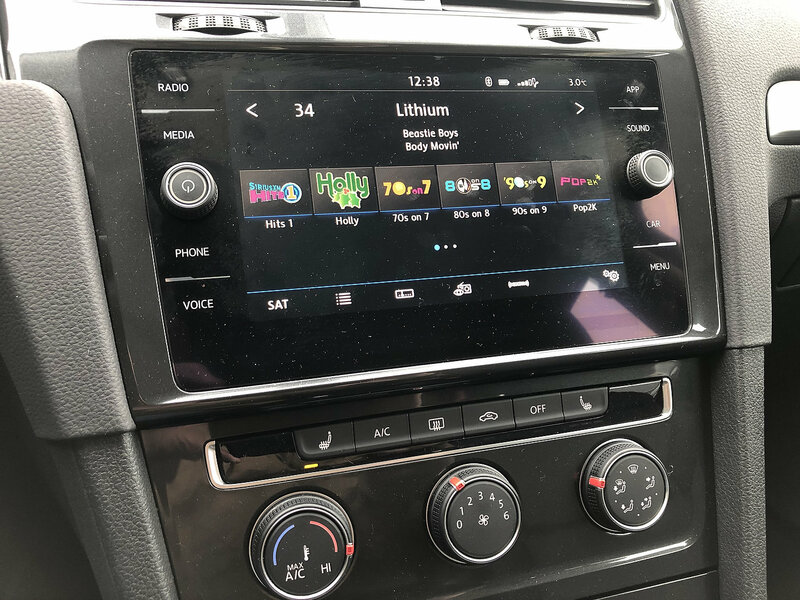 The system loads quickly and being an avid user of Waze, I love how App-Connect seamlessly transitions from the app to a call or the radio and returns. The number of USB ports is lacking but I remedied this with a 12V 2-port USB hub. 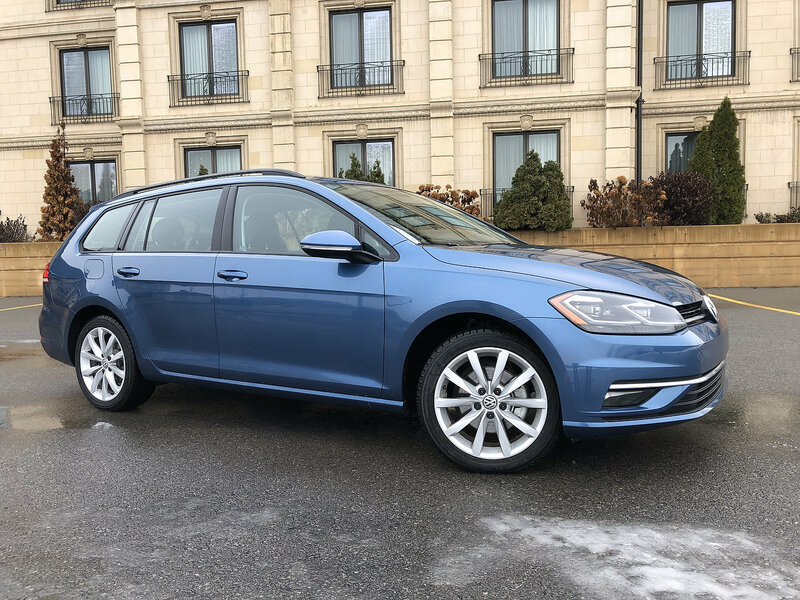 While the 2019 VW Golf Sportwagen’s utility is undeniable for a compact automobile, the drive is what ultimately lured the wife and I towards the car. 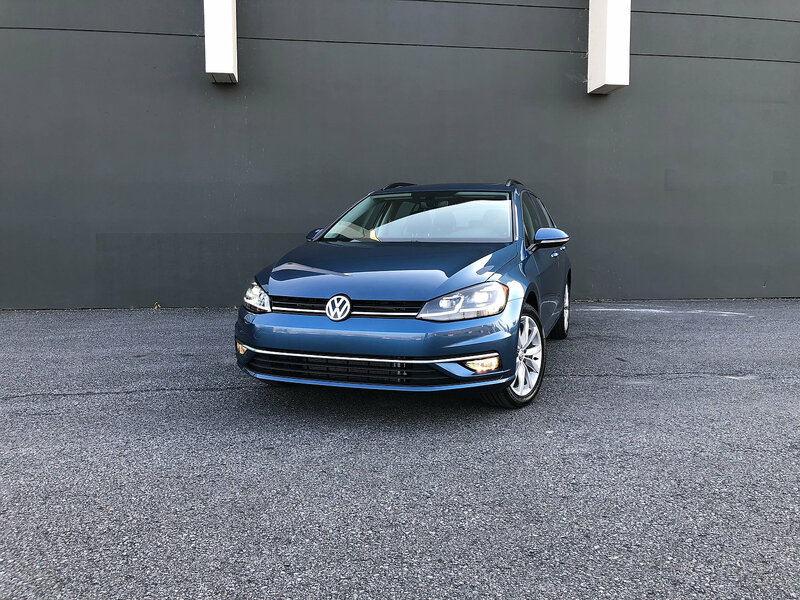 The MK7 generation Golf is built upon VW’s MQB platform which endows the car with many skills. 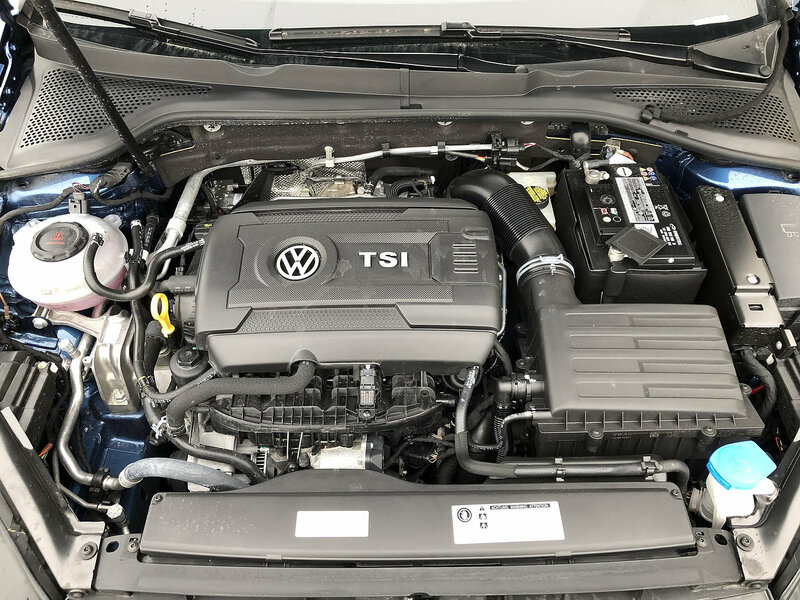 New for 2019 is the addition of the Jetta’s 1.4 TSI engine for the base FWD Sportwagens. 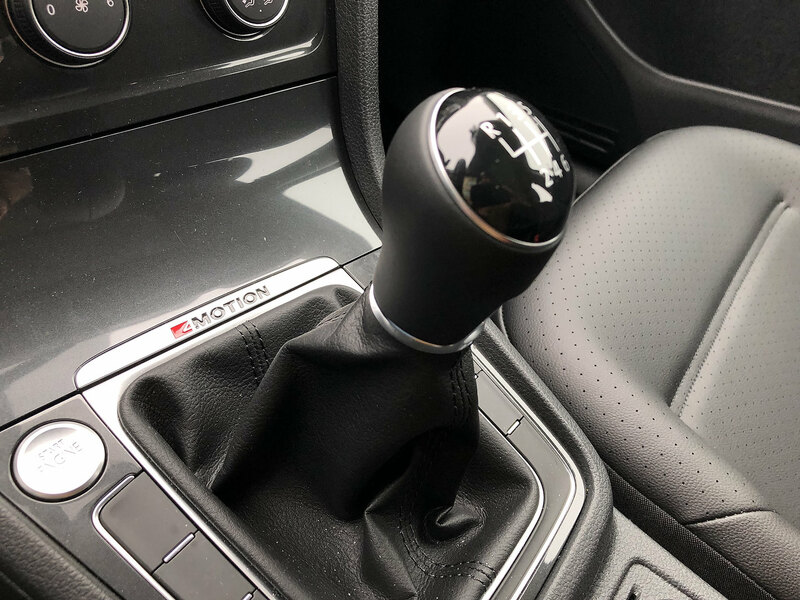 With it comes a 6-speed manual ‘box or an 8-speed automatic transmission. 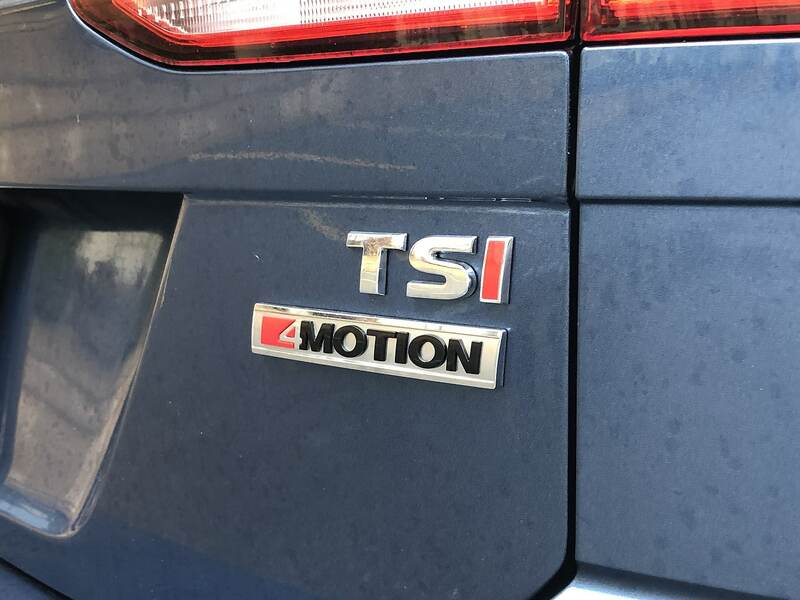 When 4MOTION AWD is specified, the Golf retains the 1.8 TSI’s services. 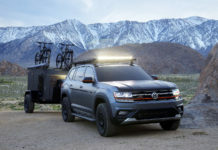 With 168-horsepower and 199 lb.-ft. of torque. 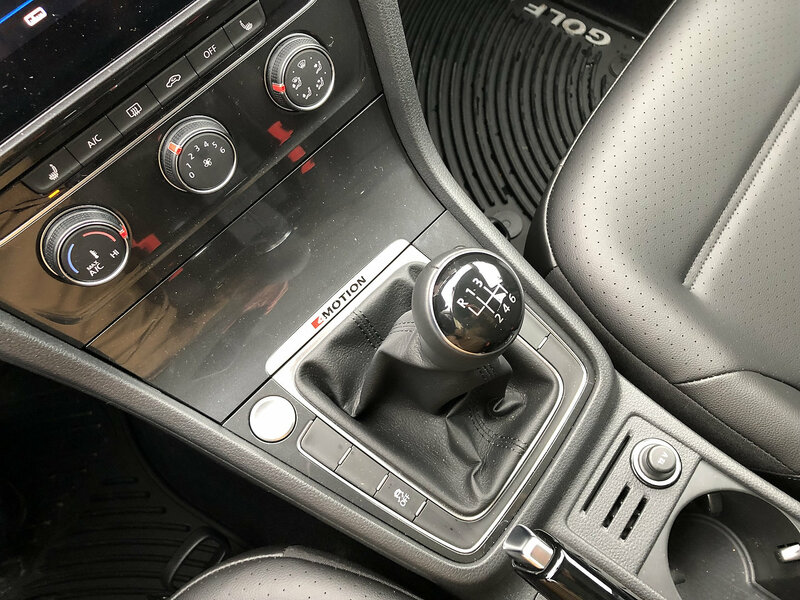 The optional transmission here is a 6-speed DSG which is an excellent performer. Thankfully, the 6-speeder is a joy to operate. Rowing through the gears is easy, the clutch pedal has precisely enough resistance and heel & toeing is a breeze thanks to pedal positioning. Here’s a piece of trivia: Did you know that just over 41% of all Sportwagens sold in Canada are specified with the #savethemanuals? I’m officially a statistic and could not be prouder to support such a worthy cause. 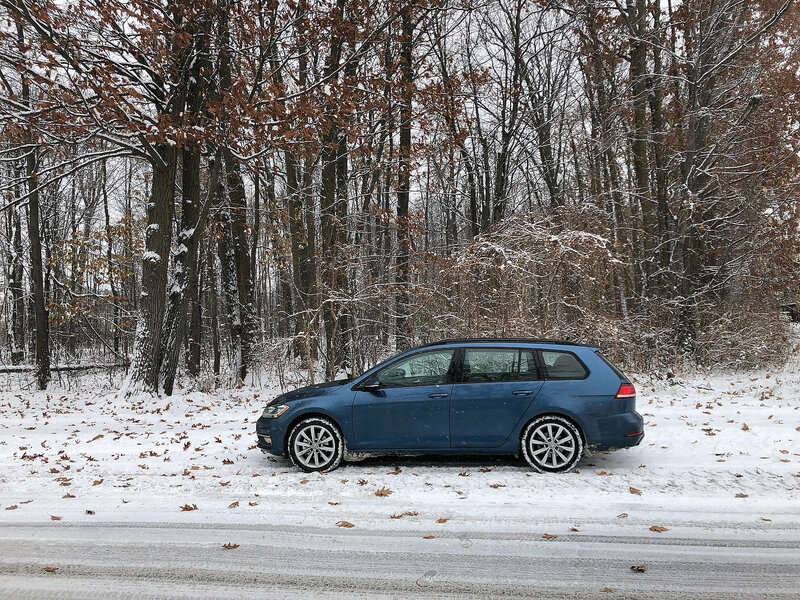 Unlike the majority of small SUVs, the Golf wagon drives like a car, because it is. The fully independent suspension, with multi-link rear setup, is compliant and sporty without electronic wizardry. Steering assistance and precision are spot-on, with no on-center play and yes, the steering wheel has a flat bottom. 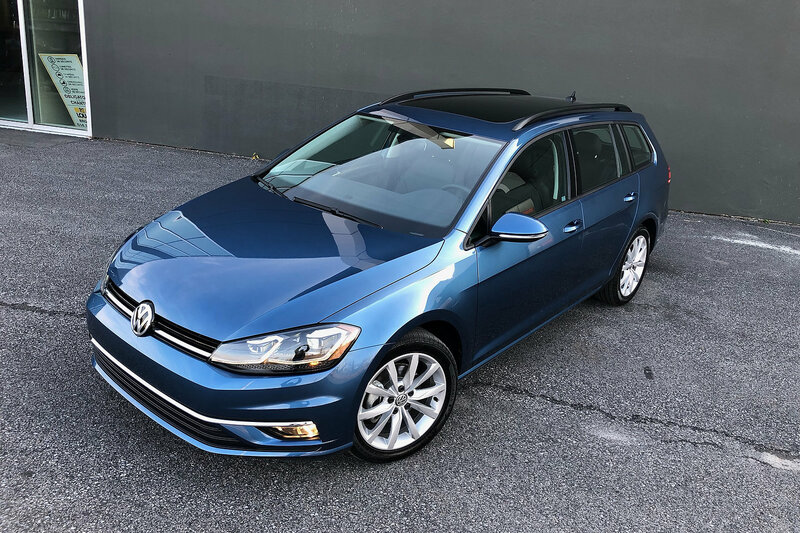 When “fun-to-drive”, utility and most importantly affordability must come together, few other cars or crossovers match what the Golf Sportwagen brings to the table. 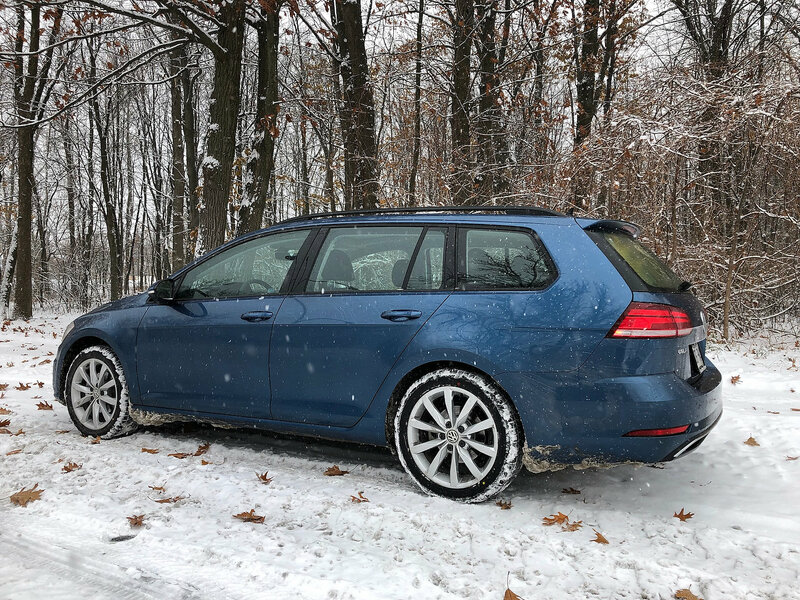 If any of you think that I may be biased in my review given this is my car, read any story on the MK7 Golf and you’ll be hard-pressed to find anything seriously negative about the car. I will say that reliability, with electronics, is the one item to watch out for. With the car’s basic 4 year/80,000 km warranty, I’m hoping most if not all bugs will pop up in this period of time. 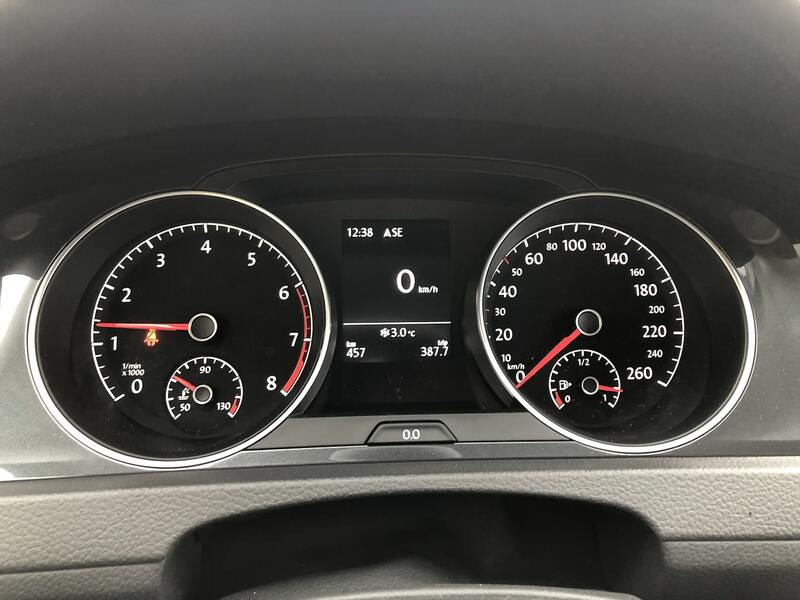 OBD11 is a very inexpensive unit that can solve your throttle response (matches GTI) as well as giving you the ability to turn off all of the traction control / ESC holdbacks. 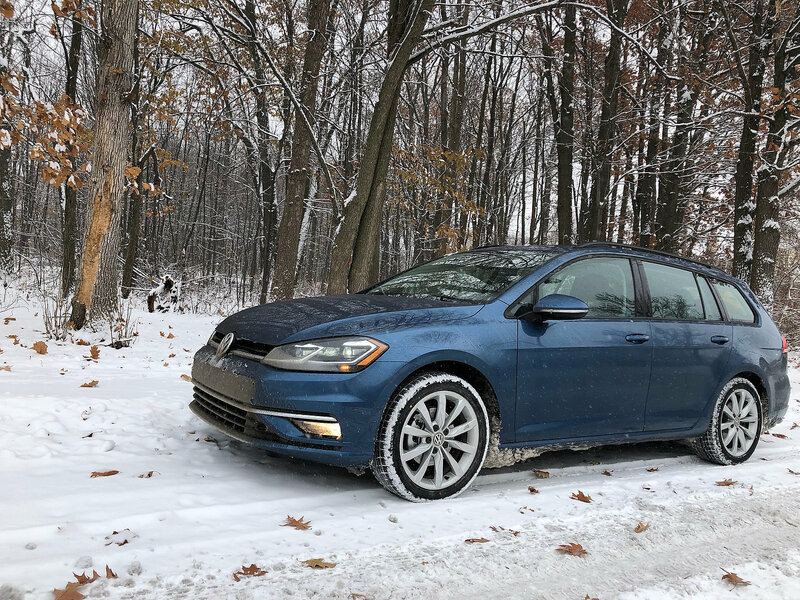 Did it to mine in December and now it is MAJOR fun in the snow!